The connected river and floodplain systems of northern Victoria provide opportunities to achieve multiple environmental benefits as water flows through the system. One water release can hit several ecosystem targets in different locations as it moves downstream. Environmental water aiming to benefit plants and animals in tributaries upstream of the River Murray (such as the Goulburn or Campaspe Rivers) can be reused downstream in the Murray itself (known as 'return flows'). Similarly, water on its way to consumptive users (such as irrigators) can be supplemented with environmental water to maximise environmental benefits along the way. Using water in this way ensures the Victorian environmental watering program can deliver maximum environmental benefits in the most efficient way possible. combining environmental and consumptive (household, irrigation and industry) water releases to achieve greater results. Environmental water can 'piggyback' on other water deliveries to achieve larger flows required to trigger fish breeding. Using water efficiently helps reduce the volume of water needed to be recovered for the environment from other water users. Here are some examples of where these measures were able to be used in 2014–15. Consumptive water was delivered to the Murray via Lower Broken Creek, avoiding Barmah-Millewa Choke (which has limited channel capacity). This delivery provided benefits for water quality and fish passage in the creek, while its delivery route helped avoid unseasonal flooding of Barmah Forest. Consumptive water on its way to the Murray was combined with environmental water, creating a larger spring flow. This resulted in golden perch spawning in the Lower Goulburn River. Environmental water provided opportunities for native fish to move, such as the Murray–Darling rainbow fish, in the Campaspe River. The water then continued flowing down to the Murray to meet more environmental objectives on Mulcra Island floodplain. Water being transferred to the Lower Murray River first flowed through Gunbower Forest. Some of this water remained in the forest to water river red gums and other floodplain vegetation. It also enabled fish to breed and move into Gunbower Creek and the Murray, as the rest of the water continued downstream to meet other needs. Environmental water delivered down the Goulburn River was pumped into Hattah Lakes, boosting the health of river red gums and black box. Some of this water then flowed back to the Murray, and continued downstream to provide additional environmental benefits in South Australia. 292 GL of environmental water supported River Murray wildlife in South Australia after first meeting Victorian environmental objectives. 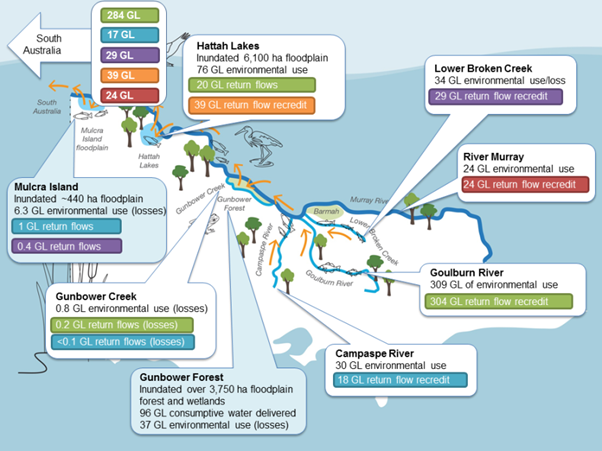 The flows – first delivered to achieve environmental benefits in Hattah Lakes, the Goulburn River, Campaspe River and Lower Broken Creek – contributed to floodplain watering at Chowilla and in the Lower Lakes, Coorong and Murray mouth.